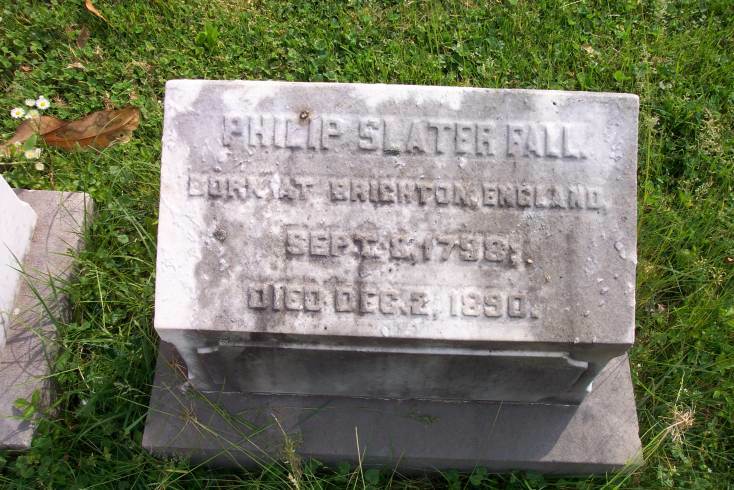 Phillip Slater Fall was a most unique and interesting preacher-educator during the early restoration movement in America. He was born at Brighton, Sussex County, in southern England on the coast of the English Channel on September 8, 1798. His father was James Fall and his mother was Catherine Barrett of middle class families. James Fall was a retired English army officer and came to America with only modest means. Phillip was the oldest of eleven children all of whom were born in England except the youngest His parents and their ten children left the British Isles and landed in America on May 10, 1817. The Fall family spent some time in Pittsburgh but shortly joined the westward movement and eventually settled in Logan County, Kentucky on a two hundred acre farm near Russellville on September 7, 1817 only one day before Phillip's nineteenth birthday. It is interesting to note that Phillip S. Fall was arriving in America about the same time that Walter Scott came from Scotland. Their paths may have crossed in traveling from New York to Pittsburgh. Restoration history would have been different had Fall become associated with Scott and George Forrester in the Pittsburgh Academy and identified with the Haldane congregation of Christians in that city. However, it remained for Fall and Scott to become associates in Kentucky when Scott became the founding president of Bacon College and Fall a charter member of the Board of Trustees in 1836. Fall later became a member of the Board of Trustees of Bethany College (1842) and served for many years with great distinction. He was closely identified with higher education among the early disciples though he never attended a college or university in America. Fall had completed a liberal and scientific education in the most celebrated schools and universities of England before coming to America. The October 29, 1874, issue of the Gospel Advocate, quoted the Nashville Banner as writing that, "There is not perhaps a more learned man or riper scholar in the United States than Dr. Fall. He is a deep Biblical scholar and a forcible speaker." Phillip now became the head of the family and the sole supporter for his siblings in a new and strange land. As the executor of his father's will he became the guardian of four of his brothers and two of his sisters. This was an awesome responsibility for a nineteen year old man to assume. However, he generated the strength and wisdom necessary to perform the task as he was able to do in his adult years as a successful educator and in his battles against religious sectarianism. There were three centers of gravity in which the "mighty works" of Phillip S. Fall were done. They were Frankfort and Louisville in Kentucky and Nashville in Tennessee. He limited his teaching and most of his preaching to these areas. He did not follow the examples of evangelists John T. Johnson, John Allen Gano and Raccoon John Smith or even Alexander Campbell but he remained rather close to his home base. He did not invite a great number of evangelists to conduct meetings for congregations where he preached. He did most of the preaching to these congregations himself. Alexander Campbell wrote in the 1843 issue of the Millennial Harbinger that, "Brother Fall has never been in favor of much excitement, nor of inflammatory protracted meetings, and calculates on the increase of the body rather after the manner of the oak than of the willow -- a gradual and firm, but long growth." Fall first taught school and preached in Franklin County, Kentucky. He probably came to Central Kentucky to visit members of the Trabue family who were relatives of his in Woodford County. He learned of an academy which was operated near Frankfort and accepted a teaching assignment there. Fall, who had been a communicant of the Church of England, was baptized by Isaac Hodgen a Baptist preacher at Mt. Gilead in Logan County in October 1818 before going to Frankfort. The Baptist church at the Forks of the Elkhorn received him into membership in September, 1819, licensed him to preach on December 11, 1819 and ordained him in June, 1820. 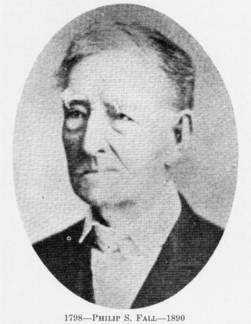 Fall was married to Anne Epperson Bacon on May 1, 1821, in a ceremony performed by elder Jacob Creath, Sr. at the historic Bacon home. In the 1850 issue of the Harbinger, Campbell reviewed his tour to the South-West. He wrote of his visit to Frankfort where he spoke to the Christian church and to the Legislature. Campbell said, "While in this city, I found myself perfectly at home with Mother Bacon, her sons and daughters, at whose hospitable abode I stopped on my first visit in 1824." The second area in which Phillip Fall labored was Louisville, Kentucky. He began to preach monthly for a few Baptists in the city whom he gathered together in 1822. By 1823 he had secured a preaching position in a private academy and began to devote more of his time to preaching. He moved his family to Louisvile where he taught and preached until 1825 when ill health forced him to return to Frankfort. However, it was while he lived in Louisville that Fall came in touch with Alexander Campbell and his teaching. Campbell made a trip to Louisville in November, 1824, and spoke in a room at Fall's Academy. Fall had read the Campbell debates with John Walker and W L. McCalla as well as copies of the Christian Baptist. But il remained for Fall to hear Campbell preach to see the difference between Baptist doctrine and "the New Testament as a revelation from God." By the time that Fall left Louisville he had converted a majority of the Baptist church to the New Testament order. On December 15, 1825, Fall wrote to Jacob Creath, Jr. in an effort to persuade Creath to move to Louisville. Fall wrote, "There is no place in which a greater field of usefulness offers." The May 15,1879, issue of the Gospel Advocate printed a letter from Fall to Mr. Alexander Campbell dated January 1, 1879, in which he wrote: "during 1825, 'the truth as it is in Jesus,' rather than as it was in John, was announced as it was clear to me . . . the congregation in September of that year adopted with unanimity a resolution to surrender its covenant and confession, and to consider itself as founded on the scriptures alone, the Lord Jesus Christ being its Head, Leader, and Commander. It had accepted previously the weekly worship in its details. My health then giving way, I gave up my charge and returned to Mother Bacon's near this place (Popular Hill)." The third area in which Phillip Fall came to exert great influence for the cause of Christ was in Nashville, Tennessee. He moved to Nashville in 1826, to preach for the Baptist church and to teach in a well known Female Academy. The Nashville Baptist church had been established by Jeremiah Vardeman on July 22, 1820. The first meetings conducted by Vardeman were held in the summer of 1820, in a Methodist meetinghouse and later in the courthouse. Vardeman left Nashville to return to Kentucky in the fall of 1820, after a congregation with a membership of one hundred fifty had been organized and a new building was under construction. 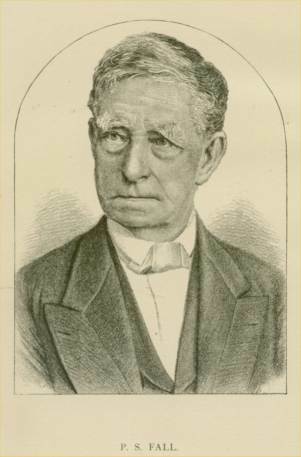 Three years later Vardeman served as moderator for Alexander Campbell in a debate with W. L. McCalla, a Presbyterian preacher, at Washington, Kentucky. By the time that Fall had recovered from the 1825 illness and had agreed to accept the invitation to go to Nashville on May 20, 1826, he had fully agreed with the principles of the Restoration Movement as espoused by Campbell and Stone. He notified the Nashville Baptist church that he must be permitted to preach the Bible as the only rule of faith and practice. 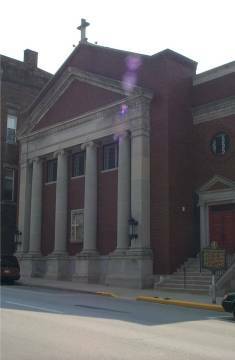 The congregation approved the proposal and soon found itself withdrawing from membership in the Baptist association, abandoning the Philadelphia confession of faith and identifying itself as a church of Christ. In December, 1830, in company with Jacob Creath, Jr., Alexander Campbell paid a visit to Phillip Fall and the Nashville church. Campbell wrote in the March 1831, issue of the Harbinger that: "This congregation is so far advanced in the reformation as to meet every Lord's Day, to remember the Lord's death and resurrection, to continue in the Apostles' doctrine, in the fellowship, breaking of bread, and in prayers and praise." After five successful years in Nashville, Fall's physical affliction forced him to resign his posts there in June, 1831, and to return to the Bacon home in Frankfort. After a period of rest and recovery, in the hospitality of "Mother Bacon's home" under the care of his ever attentive wife and children he proceeded to organize the Female Eclectric Institute at Popular Hill. He developed and administered one of the most outstanding educational institutions in the commonwealth where he wrote Campbell in 1838, "More than half ow number are disciples and we have regular congregational worship." Many of the early leaders of the Restoration Movement enrolled their daughters in Fall's school including Raccoon John Smith who preached in Frankfort as early as 1829. On December 2, 1832, "The church of Jesus Christ was constituted in the old courthouse" at Frankfort. John T. Johnson and Phillip Fall were present when seven members agreed "to take the Holy Bible, and it alone, as their rule of life." The first building was completed on Ann Street in May, 1842, and Fall preached the dedicatory sermon. He continued faithfully as a preacher and teacher in Frankfort until 1858, when he returned to Nashville at the pleading of the church which had been divided and scattered abroad as a result of the teaching of their "spiritualist" preacher Jesse B. Ferguson. When Fall left Nashville twenty-five years earlier there were two hundred fifty members living and worshiping in harmony and unity. When he returned he found that the meetinghouse had mysteriously burned and there were only forty-five white and fourteen black members who had not been led away after the false teaching of Ferguson. Fall was successful in bringing the flock back together and in converting others to Christ. During the following twenty years in Nashville he is credited with increasing the membership of the church to over six hundred and in bringing "order out of chaos and peace out of contention." The January 3, 1867, issue of the Gospel Advocate announced that Fall had "consented to assist the editors of the Advocate in conducting that paper during the present year so far as my duties -- as an evangelist for the congregation of Christ in Nashville and president of the Board of Education will allow." The editors at the time were David Lipscomb and Fall's brother-in-law, Tolbert Fanning. Fall remained in Nashville until 1877, when because of advancing age and declining health he resigned his responsibilities in Nashville and returned to Frankfort. 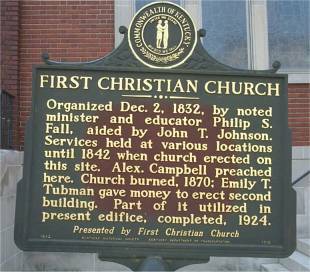 During the period while Fall was absent from Frankfort the church building was destroyed by fire, Emily Tubman had contributed the funds necessary to construct a new building, the pulpit had been filled by W. T. Moore (1858-64); Samuel W. Crutcher (1865); T. N. Arnold (1866-67); Aylette Raines (1868-69); T.N. Arnold (1870); B. B. Tyler (1873-76); and George Darsie (1876-1904). Darsie was serving as minister when Fall arrived back in Frankfort in 1877. The period of the early 1870's was one of great unrest and dissention in the Frankfort church over the question of instrumental music and the missionary society. On August 11, 1872, Isaac Errett preached the dedication sermon when the new building was completed and W. T. Moore followed with a revival meeting. On Saturday before the Sunday dedication some of the members purchased and installed an organ to be used in the Lord's Day worship and during the meeting. T. N. Arnold, the minister, and twenty-two members signed a petition opposing the introduction of mechanical instruments of music in the worship. Errett and Moore were not opposed to the use of an organ in worship. However, W. H. Hopson wrote a scathing article published in the September 24, 1872 issue of the American Christian Review and reprinted in the October 5, 1872, issue of the Christian Standard in which he severely criticized those who ran rough-shod over those who opposed the organ and caustically castigated Errett and Moore for their role in approving the use of the instrument. Hopson charged that the act was committed "defiantly" which Errett denied. The writer has been unable to find anything which Phillip Fall said or did to represent his opposition to the use of the organ. He evidently accepted the decision of the Frankfort church to use the organ which was being done when he came back to Frankfort five years later. However, Fall failed to go farther and apply this principle of worship being “wholly scriptural” to the use of an organ in worship, either in Nashville or Frankfort. Another sermon by Phillip Fall was published in the April 1, 1875, issue of The Gospel Advocate which has been delivered in Lexington, Kentucky on September 8, 1874. Still another sermon was printed in the Advocate on January 28, 1892, on the subject, “The Lord’s Supper.” The sermon was preached about a year before he died and the copy was found among his papers by his niece, Betty Taylor. The copy was supplied to the Advocate by his sister, Charlotte Fanning. Fall took a strong stand on the principle that the “Lord’s Supper as an act of worship must be observed in spirit and truth.” Never-the-less he failed to indicate that the use of an organ in worship violates the same principle. So when Phillip Fall returned to Frankfort in 1877, he continued to worship with the local Christian Church which he had established as “the church of Jesus Christ” in 1832. He also preached there at interval during the remaining thirteen years of his life. In 1887, the local preacher, George Darsie, was granted leave of absence to do mission work in Boston and the eighty-nine year old Fall filled the pulpit each Sunday in spite of the fact that he was almost totally deaf. Phillip Fall was wholly devoted to his Female Eclectic Institute at Popular Hill. At one time Thornton F. Johnson endeavored to persuade Fall to move the Institute to Georgetown, Kentucky and join with Johnson in forming a Literary Institute. Fall declined the offer and Johnson turned his attention to stabling Bacon College in 1836. T.F. Johnson was a graduate of West Point Military Academy with a degree in Civil Engineering. He came to the Baptist Georgetown College as a member of the faculty in 1829. Johnson was converted by Barton W. Stone and became a member of the church where Stone preached. By 1836, a new president had been selected by the Baptist college who promised the State Association that he would purge from the faculty those professors who were identified with “Campbellism.” Thus, Johnson left the faculty and dedicated himself to a new effort which he hoped would attract Phillip Fall. However, when Fall refused to come for the second time Johnson moved to organize the “Collegiate Institute and School of Civil Engineering.” But with the advice of other leaders among the disciples the name was changed to Bacon College to honor Lord Francis Bacon. One is prone to question what the trend of events would have been in the Restoration Movement has Phillip Fall became associated with T.F. Johnson in establishing and developing a Female Collegiate Institute in Georgetown. In all probability, we would not have had Bacon College, Kentucky University, the College of the Bible or Transylvania University. The movement might have been void of some of the great Christian educators of the 1800’s. Phillip Fall and other members of his family were deeply committed to Christian education and evangelism. His sister, Charlotte, became the second wife of Tolbert Fanning and assisted him in his educational enterprises in Tennessee. His brother, John T.S. became the publisher of the Gospel Advocate. 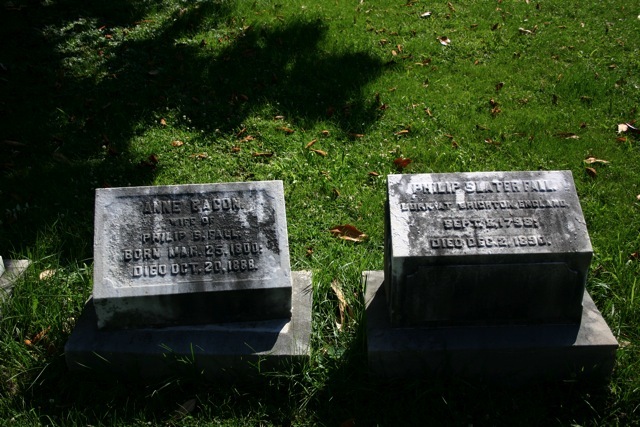 His son William, became an outstanding gospel preacher and another son, James S., was a charter student in Bacon College, and later taught in Bethany College and in the Midway Female Orphan School. Another sister of Phillip Fall married John T. Tompkins who evangelized with Samuel Rogers at Old Somerset church in Montgomery County, Kentucky in 1852 and Tompkins died a few years afterwards as a young preacher. 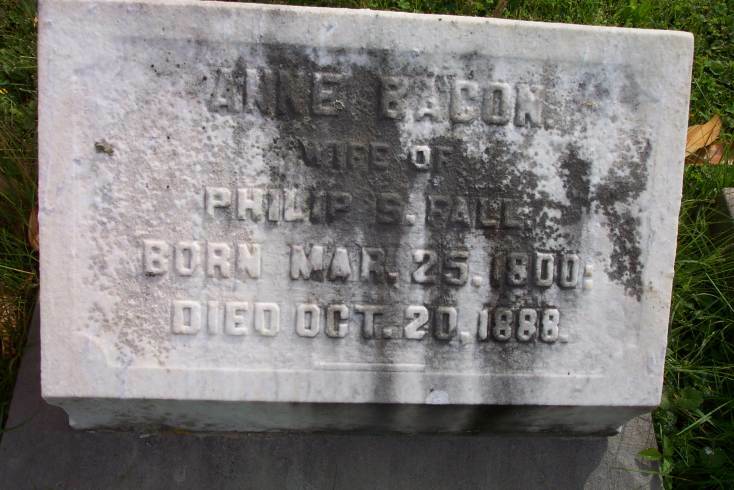 Ann Bacon Fall died on October 29, 1888, after a series of severe strokes, and her husband Phillip Fall died on December 2, 1890. 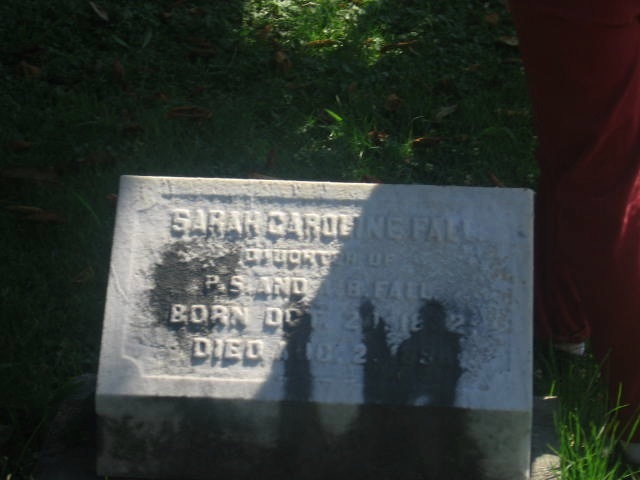 Their unmarried daughter, Sarah Caroline (Carrie) Fall who was the untiring nurse for her father and mother, died on August 2, 1891, and was buried alongside her parents in section “M” of the Frankfort cemetery. The stone which marks the resting place of Phillip Slater Fall’s mortal body is under the shade of a large magnolia tree in Frankfort Cemetery in Frankfort, KY. The tomb stone is overlooked by the monument of the noted pioneer, Daniel Boone, whose sister Hannah, was identified with the restoration preaching work of John Mulkey. She was buried in the cemetery at the old Mulkey meetinghouse near Tompkinsville, KY. Overlooking the Fall grave also is the monument of General Richard M. Johnson, vice-president of the United States under President Martin Van Buren and brother of John T. Johnson, a former state legislator, congressman, court judge and distinguished gospel preacher. The writer does not know what George Darsie said at Fall’s funeral or how long it took him to say it, after fall lay in state for three days, but the Frankfort Christian Church has preserved a wonderful collection of his papers. The writer hopes that he has not don an injustice to the wishes of Phillip S. Fall in this short biographical sketch. Source: The World Evangelist, September 1991, page 5; October 1991, page 3; November 1991, page 4. *Note: Other sources differ from the above concerning the deaths of both of Phillip Fall's parents in Logan County. There was a recollection by his sister, from "Family Recollections" by Elizabeth Ann Shffield Fall Adams, third daughter, fifth child of James Slater and Catherine Barratt. She recalled that her mother Catherine died in Adair County soon after the family arrived at a cousin's (Fenelon Willson) home. She was buried in a Baptist Cemetery where pastor Hedgens was preaching. Their father got sick and was unable to attend the funeral due to illness. After improvement in health he and the children soon departed for Logan county, where he soon died in the home of distant relative Stephen Trabue in December. He was buried in the Trabue Family Cemetery. Family landed In America, New Brunswick, New Jersey with 10 children and one on the way. The eleventh was born 10 days after arrival. Three weeks after arrival in Columbia, Adair County, Kentucky, Catherine succumbed to “bilius fever” brought on by traveling in a wagon, nursing a three month old, and utter exhaustion. She was buried in the Baptist Cemetery in Adair County. She left 11 children from 3 mos. to 19 yrs of age. Arrives in Logan County, Kentucky. James is ill on the trip over from Adair County, but family presses on to Logan County, to a distant relative, Stephen Trabue. Purchased a 400 acre farm near Russellville, and began making an effort to build a home. James Fall dies in the home of friend Stephan Trabue and buried in the Trabue Family Cemetery in Logan County, Kentucky, 100 miles from where Catherine was buied. Fall was married to Anne Epperson Bacon, performed by Jacob Creath, Sr. at the Bacon family home. PF meets Alexander Campbell, who came to Louisville where he spoke in a room at Fall’s academy. Illness forced him to move his family back to his inlaws at Frankfort. By the time he left Louisville he had converted most of the Baptist church where he preached to the ancient order of things. Accepts position of minister of the Baptist church in Nashville with the understanding that he would be permitted to preach the Bible as the only rule of faith and practice. Soon the church transitions to a church after the first century order. Due to poor health, after five successful years in Nashville PF was forced to vacate his position in the Nashville church and return to the Bacon Home in Frankfort. Battle of Fort Donelson, Phillip and Ann Fall’s son, fighting for the South, dies in battle. Due to age and declining health, PF retires and returns to the old Frankfort, Kentucky home. PF filled the pulpit at Frankfort Christian while the minister, George Darsie is on leave to do mission work in Boston, Mass. P.S. Fall is buried in one of our nation's most beautiful and prestigious cemeteries, Frankfort Cemetery. It is set on the cliffs above the Kentucky river across from the downtown area of Frankfort. Many dignitaries are buried there, of which the most prominent was none other than Daniel Boone. Fall is buried very close to Boone's grave. After entering the cemetery follow the signs to the grave of Daniel Boone. Continue past until you see the Revolutionary Section on the right. Stop there and Fall's grave is across the drive back to your left. While parked there be sure to visit the Daughters Of The Revolutionary War Section where Rev. John Gano, grandfather of John Allen Gano, is buried. (On the map at the entrance of the cemetery, Fall is shown to be buried in Section M, Number 24 on the tour) For directions to Frankfort and the cemetery be sure to see the map hyperlink below.